This walk: 2014-10-1. Burrator Upper Quarry, Drake's Plymouth Leat, cobwebs, grey squirrel, explosives stores (x4), Burrator Dam, commemorative plaques, Burra Tor, anchorage points, Sheepstor Dam, ducks, memorial benches, Longstone Manor. Previous walk in this area: 18th March 2009, 17th March 2010 & 18 May 2011. NB - Most photos were taken during the "recce" on 15th Sept.
Dew-laden cobwebs on gorse ..... note the common orb web at upper left quadrant. "The Upper Burrator Quarry offers an opportunity to view a rare exposure of the contact between the Dartmoor granite and Devonian rocks. Indeed, veins of pink granite can be seen penetrating these rocks which were once slates resulting from the deep burial and intense deformation of mudstone originally laid down in marine conditions. However, the high temperatures that resulted from the intrusion of the hot granite transformed them into recrystallised rocks known as hornfels. Minerals such as black tourmaline have been formed in the original slate." Dartmoor granite is about 280 million years old, (= Late Paleozoic Era, Permian-Carboniferous Period) the Devonian rocks are about 370 million years old (= same era, Devonian Period). "This site features rare exposures of the contact between the Permo-Carboniferous Dartmoor Granite and Devonian country rocks of the Kate Brook Formation. The contact is highly irregular and shows evidence of mobilisation of the metasediments and segregation of felsic and mafic constituents. The contact country rocks have been thermally metamorphosed to form hornfels with extensive tourmalinisation." A close-up of the interface between the granite and the Devonian rocks, with the Devonian on the left. Numerous granite posts edging the road, some still show the brackets that once held iron chains used for safety - life was different once. General view walking towards the dam, mind your heads! Sign along the way - the top left "Public footpath" leads to the base of the dam, although access is barred. The track junction, down to the dam, up to the old public toilets on the road. The end i.e. the part of the leat nearest to the dam. About as close to the dam as you can get at this low level. Explosives store (no. 1 of 4 recorded on this walk and its 'recce'): features include a cement/concrete door and roof with probably non-ferrous door fittings to prevent sparks that might set off an explosion. There are also vents to prevent the build-up of flammable gases as fumes from explosives. 1985 commemorative plaque to mark the 400th anniversary of the Act of Parliament authorising the building of Drake's Leat to bring water to Plymouth. Plaque to commemorate the opening of Burrator Dam in 1898. Plaque to commemorate the enlargement of the dam during 1923-1928.
of the reservoir from a capacity of 668 to 1026 million gallons. Depth indicator to estimate the reservoir's remaining water. Looking down away from the water - by holding the camera out at arm's length. Plaque marking that 110 feet below is the foundation stone of the dam (1895), seen halfway across the dam. A two-level drinking trough below the belvedere(?) - low level for sheep and dogs, high level for ponies and cattle. Looking down on the dam. Moss with spore bearing capsules. A wall near the back of the tor. Sign by a stile at SX 55287 68103, which allows entry to the lake-side. Anchorage points for the old suspension bridge that was used while the dam was being raised between 1923-1928. Inside the 'shed' was some equipment for what purpose? It seemed to go down to the water - for depth measurement? A piece of old (and quite substantial) chain. There is some old ironwork in the top of the block. That's them today - a happy troupe! View to Peek Hill (left) and Leather Tor (right) with a bit of the summit of Sharpitor (centre). Somewhere nearby, at approx. SX 5576 6799, is the growan quarry - being a dump of material from the excavation for the foundations of the nearby earth dam that are bedded about 32 metres down, going down some 30 metres through growan and then another 2 metres into solid granite. Landmarking the trough, near the end of a cobbled walk and with a loose trough in view (at the top of the beach), about 35 paces away. A square hole, of the type used as a socket for a granite cross. The possible socket stone and the exposed gatepost, seen together. Notice board. Click the image to see a larger version. Apple crucher where the top wheel was pulled around the cicrular trough by a horse to crush the apples. Recently mortared wall top, for consolidation of the ruins and to prevent future deterioration. A view of the Sheepstor Dam. Explosives store number 3, SX 55557 67960, right beside the road at the entry gate into the Sheepstor Dam, quite overgrown at present. Almost back at the quarry. Column of unknown function in the quarry - possibly a crane base? Explosives store number 4, completely hidden under rhododendrons beside the drive of Burrator Lodge leading to the new Burrator Heritage Centre, nearly halfway along. 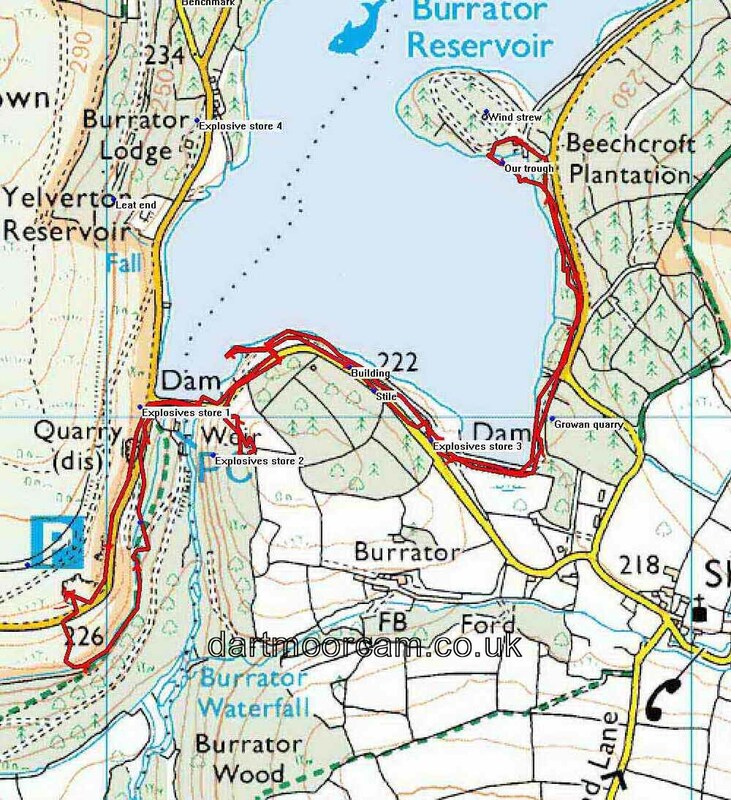 The walk was accessed very easily via the road from Yelverton and Dousland, with parking at the P symbol near the bottom of the map below the Quarry (dis) markings near the Dam. Distance - 4.72 km / 2.93 miles.